Made in Sydney, New South Wales, Australia, C.1910-1960. This collection of glass was designed and made by The Crown Crystal Glass Company and Australian Glass Manufacturers c.1910-1960. Australian Crystal Glass Limited was established in 1915 in Wyndham Street, Alexandria, NSW, making pressed and hand blown glass. By 1917 hand blowing had ceased and only pressed continued. 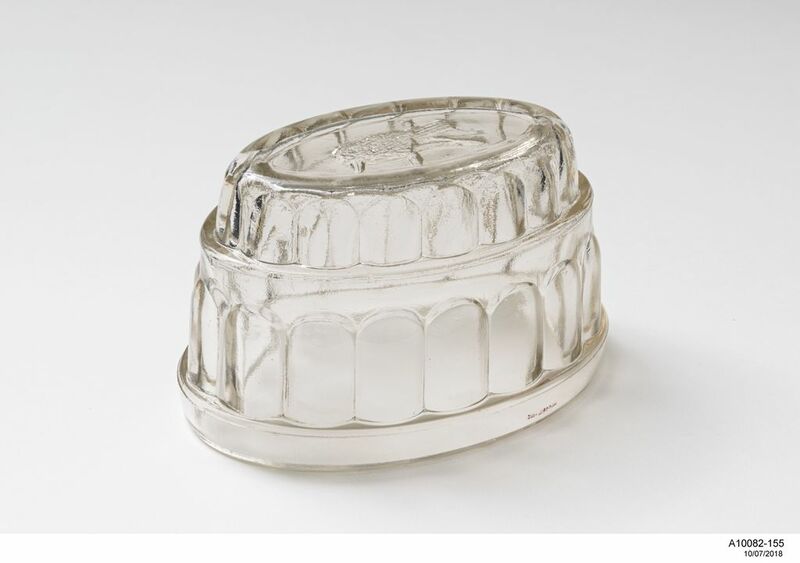 From 1922 to April 1926 the company became 'Crystal Glass Ltd' and then in 1926 they amalgamated with Australian Glass Manufacturer's - Crown Glass Works and became known as The Crown Crystal Glass Works Co. Ltd (ref. M. Graham, Australian Glass of the 19th and early 20th Century, p.88). By 1932 The Crown Crystal Glass Co Ltd, was based at Waterloo, and their Trademark resembled that of a 'map of Australia'. This collection of glass was accumulated by Judith Cooke, who lived at Blayney in regional NSW. Her collection was largely influenced by the advice of Marjorie Graham who was a well-known collector and writer (28 May 1924 - 30 May 1994). The glass collection was purchased by the Powerhouse Museum in 1984. The object file now includes the correspondence from Marjorie Graham to Judith Cook in which Marjorie's advice is outlined. Judith Cooke gave the correspondence to the Museum in January 2000, to accompany the glass collection. Marjorie Graham was a passionate collector and historian. She is predominantly known for establishing a substantial collection of Australian ceramics and glassware and wrote two books on these topics: 'Australian Pottery of 19th and early 20th Century' (1979), and 'Australian Glass of the 19th and early 20th Century' (1981). In addition to her glass and ceramic collections Marjorie also collected Australian tin kitchenware, dolls, postcards, embroidered linen and cotton work, bookmarks, sheet music and biscuit tins. She was a regular contributor to The Australian Antique Collector, a lecturer on Australian Decorative Arts and an Honorary Associate of the Museum of Applied Arts and Science, Sydney. (28 May 1924-30 May 1994).